Master Players’ Concert Series Encore China Trip Steven E. Hastings June 1 – 14, 2014 Pictures at: https://www.flickr.com/photos/sehastings1/collections/ This was my second trip to China with my friend, Xiang Gao and his family – to all of them, Xiang, Renee and Sammi, I say thank you for introducing me to your wonderful country and heritage. You are the most gracious and considerate ambassadors of China I could ever hope to meet. Steve Day 1, 2 – Bejing – Sun, Mon, June 1,2 A very long flight from JFK to Bejing, China Day 3 – Lijiang –- Tues, June 3 After a very short night of rest – we left the airport at 5:00 am – and headed back at the Beijing airport to board a 3-hour flight to Lijiang in Yunnan Province. Yunnan is also spelled Yun Nan and Yunan – so take your pick! Xiang is a most gracious host – he had the local KFC deliver coffee to the hotel at 5:00 am this morning. I had already made a cup in the room and, then, most of us hit the Starbucks in the airport. So, by 7:00, I was on my third cup – life is good! Last night, we shared a “light dinner” of 4 – 5 appetizers and 6 – 8 entrees, all ordered by Xiang. It was primarily Northern China cuisine – lamb, chicken, beef, vegetables and lotus root. Dessert was a triangular shaped form of sticky rice with dates in the middle – sweet to Chinese standards, not by American “sticky bun” standards. As we flew, I learned from the video being shown on the plane that the Yunnan Province is one the riches tea producing areas of China. In fact, there is evidence to suggest that Pu’er tea was cultivated for medicinal purposes in this region more than 1000 years ago, and it is the birthplace of tea cultivation (for the record, India disputes this claim). Fossils found in this region of a broad leaf plant, believed to be the predecessor of the tea plant of today, have been carbon-dated to 35 million years ago. Arriving safely, our adventure began. We checked in to a “boutique hotel” just at the south entrance of the Old Town of Lijiang. It turns out that there are several old towns in the region and we were to visit another one, Shuhe, after lunch. As usual, a Xiang provided us with many factoids regarding the town as we drove in from the airport. The Old Town of Lijiang is 800 years old and is a UNESCO World Heritage Site. Most of the people are Nexi, one of the 55 recognized minority nationalities in China. They practice the Dongba religion. From the bus, we saw small plots of corn, tobacco, and rice. We are at 6000 feet and will travel higher tomorrow. Lunch was your typical 12 dish feast with beer. After lunch, we had a tour of the local Dongba museum. Needing a walk, we took a walk through a beautiful park. The mandatory group picture was taken with the Jade Dragon Snow Mountain in the background. Then, off to Shuhe Old Town. By 5:00 pm, most of our group was tired so we returned to the hotel for a brief rest before dinner. Dinner was amazing to say the least. I lost count of the entries. Local specialties we tried were goat, yak and river frogs. For the non-meat eaters, there were a mint salad, snow pea tips (of the plant) and egg plant cubes fried in duck egg yolks – not your typical Delaware fare. After dinner, most rode the bus back to the hotel. Four of us rode in the bus part of the way and then walked back through Old Town. There were hundreds of shops and vendors and thousands of people out enjoying the wonderful night. We were tempted by a couple of the night clubs, but settled for the local frozen yogurt shop. Tomorrow, we travel to “the mountain”! Wake up call at 6:00 am. Day 4 – Lijiang – Wed, June 4 Today, we made the journey to Jade Dragon Snow Mountain National Park. We traveled by private bus, park bus, extended golf carts and, finally, gondola to arrive at the Spruce Meadow at 10,000 feet elevation. The scenery was excellent. This is a popular tourist attraction, but we arrived early and early June is “slow” for tourists in this area. Leaving the meadow, we traveled by extended golf cart, gondola and park bus to the 2,700 seat open-air auditorium in the park. 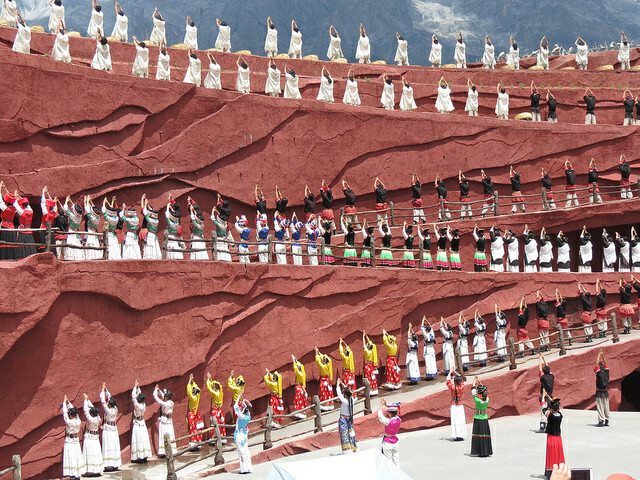 Twice a day more than 500 dancers (and a few horses) perform a show called Impression Lijiang. 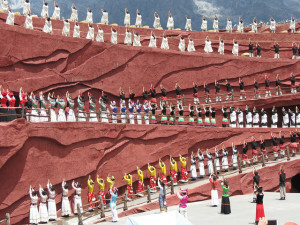 This show celebrates the history and culture on the Lijiang region in song and dance. According to Xiang, it cost 40 million US dollars to build the auditorium and produce the show. Then, of course, we went to lunch at a “family restaurant” in a Baisha, a small village near the park. It was a family operation; and, of course the food was amazing. More yak, which I am developing a taste for – think Yak Burgers at the Deer Park! A unique dish was a fried egg and tomato plate. For dessert, we tried a fried goat cheese that was dipped in sugar and a sticky rice roll filled with brown sugar. Could either of these be bad, really? After lunch, we visited the Baisha Embroidery Institute. One of the teachers provided a very interesting history of the embroidery industry in the region. In a nutshell, it developed as a product that was not fragile and could be shipped via horse on the South Silk Road. Young women from the villages come to the Institute and train for six years to make incredible detailed, almost photo-like, embroidered products. Depending on the detail, a picture can take months to make. The collectable products sell for several thousands of US dollars. We returned to the hotel for a rest, before gathering for dinner. We traveled by bus across town to an enormous restaurant. Quickly, food began to appear – deep fried bacon, a mild eggplant dish, chicken and vegetables, slow cooked pork bellies, and a sweetened lotus root are the ones that stand out. Many dishes contained local mushrooms. For dessert, we had the lightest egg custard tart you can imagine. After dinner, part of the group headed to the Old Town in Lijiang. The rest retired to the hotel as we had a 5:45 wake up call to catch a short flight to Chengdu. This is Xiang’s favorite city in China – supposedly, the cuisine is excellent. Day 5 – Chengdu– Thurs, June 5 This morning we took a short, 50-minute flight to Chengdu, a prosperous city of 10 million people. The difference in Lijiang and Chengdu is like night and day! Chengdu was recently named a Tier one city in China. It is know to be friendly and relaxed and has 20,000 restaurants! On the drive from the hotel, we stopped to see the New Century Global Center – reportedly, the largest building in the world. It includes offices, apartments, a mall, a hotel, a daycare, numerous restaurants (McDonalds included), an amusement park, and a water park with a beach! Basically, if you live and work in the building, you never have to leave it. This city is the center of Sichuan cuisine, known to be numbing, spicy and very favorable! To verify that, our next stop was lunch. The dishes were spectacular – duck with Sichuan peppers, Chinese broccoli with peanut/sesame sauce, celery with water lily petals (very healthy), spicy beef with pumpkin and rice, twice cooked pork (more bellies cooked twice) pan fried organic tofu and fore dessert, almond cake – a local specialty. And beer, of course. Just to clarify, the beer here is what I would call 3.2 beer – less alcohol than our beer – thank goodness! After lunch, we had a 2-hour bus ride to Sanxingdui Museum – a relatively new museum and grounds on the site of an extraordinary historical site for China for the Ba People of China. Here we saw pottery, jade, and bronze pieces from 2000 to 4000 years ago – let that sink in please! There are 5 pieces in this museum that China considers “national treasures”. The “story” is that many of the creatures and ideas (the Tree of Life) from the movie Avatar are based on pieces found here. We arrived back in Chengdu in time to “freshen up” quickly and head to the best Chengdu Hot Pot Restaurant in town. They had actually cancelled our 6:30 pm reservation because we were 10 minutes late and they had customers waiting. Xiang worked his magic and got us in at 7:30 pm. A Chengdu Hot Pot dinners is truly an experience – relaxed, for conversation and interaction. The goal is to “make you sweat” from the spices, flavor and heat. Two large pots of “soup” – one spicy and one not – are heated in the middle of the table. Raw meats and vegetables are then “cooked” in the soups – much like fondue. Our items included thinly sliced lamb, beef, chicken, pork meatballs with cilantro, lotus root, and a parsley-like vegetable. After items are cooked, each is dipped in a sauce of oil with garlic and sesame to tamper the “heat”. All were delicious! Dessert was sesame coated rice balls with black sesame paste inside. Then, a driving tour of Chengdu and back to the hotel. 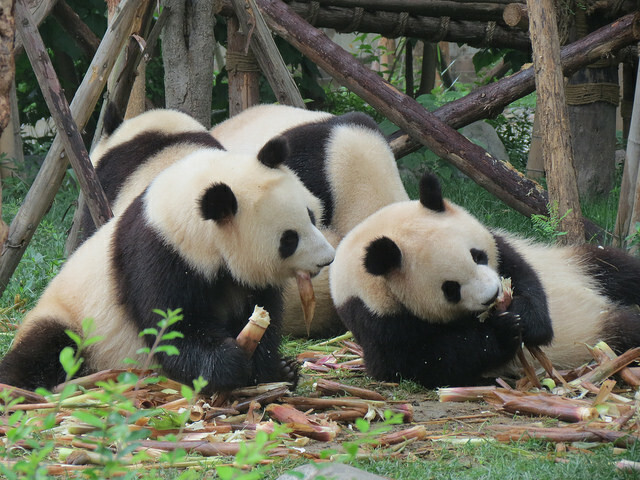 Day 6 – Chengdu – Friday, June 6 Today was one of the highlights of the trip as we visited the Panda Research Center at Chengdu. A short 30 minute drive from the city, it is one of 50 such centers in China. There are approximately 2000 Giant Pandas in the world – some 300 of those in captivity. These gentle creatures are millions of years old, existing when dinosaurs roamed the earth – they should be extinct. 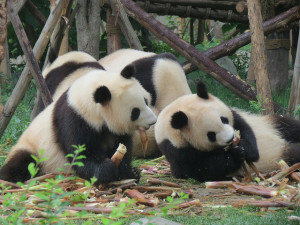 They are carnivores, but eat almost exclusively bamboo. Survival of babies (born the size of a big mouse) in the wild is difficult so the centers assist procreation either by natural mating or artificial insemination. The Center is really a large park that provides the habitat that the panda require. They also provide food supplements. For years, panda pairs were given as diplomatic gifts to other countries, but no more. Now, they can only be “leased” for $1 million per year. Amazingly, they sold panda “things” in the numerous gift shops – capitalism is alive and well in China! We ate lunch in a small café in the Center – spaghetti, Chinese beer and a banana split for dessert. Back at the hotel, a short rest and a walk down JinLi. From Wikipedia: “Nearby Wuhou Shrine, JinLi is a popular commercial and dining area resembling the ancient-style architecture of West Sichuan. “Jinli” is the name of an old street in Chengdu dating from the Han dynasty and means “making perfection more perfect”. The ancient Jinli Street was one of the oldest and the most commercialized streets in the history of the Shu and was well known throughout the country during the Qin, Han and Three Kingdoms Periods. Many aspects of the urban life of Chengdu are present in the current-day Jinli area: teahouses, restaurants, bars, theatrical stages, handicraft stores, local snack vendors and specialty shops.” Xiang and I shared two delicacies on the walk: deep-fried “hard-shell” crabs (you eat it all, including the shell) and a smoked whole quail (you don’t eat the bones) – both quite delicious! Pictures will be posted on Flickr for you non-believers! Dinner at a local restaurant was the usual fare: tea soaked goose, rabbit, fresh bamboo, lotus flour salad, beef marinated in black bean sauce, Peking duck, egg plant stuffed with pork, shrimp wrapped in angel hair pasta, meat balls in tomato sauce, and banana sticks for dessert. Total cost was $18.00 per person. The three key elements of Sichuan food are: presentation, smell and taste – our meals so far have had all of these. Day 7 – Jiuzhaigou – Saturday, June 7 Another flight, this time to Jiuzhaigou (joe–gi-go). Tomorrow, we will visit Jiuzhaigou Valley National Park (aka Nine Valley Village National Park) in typical American style – in a bus. The next day we actually do some hiking (hopefully, working off the meals from the last few days). Jiuzhaigou is in the part of Sichuan Province that is very close to the Province of Tibet so most of the people, culture and practices are Tibetan. We stopped at a Tibetan “family restaurant” for lunch. We were welcomed with scarves, had our hands washed and touched a special rock for luck – all the while having our pictures taken for purchase later! Seated at short tables, we ate boiled potatoes, mushrooms, barley bread, a “green something”, and drank barley wine (very strong – sterno like) and yak butter tea. I treaded lightly on this meal. Then, a 2-hour bus ride to Jiuzhaigou Valley National Park. We drove through some of the most desolate lands I have seen, scattered with small-scale vegetable fields and yak farms. We were at 9,000 feet at the airport and peaked at 11,000 feet on the drive – portable oxygen tanks were provided – before descending into the valley. Then, a drive through some of the luscious forests I have ever seen. We ended up in the village that surrounds the entrance to the park. Shops, restaurants, and souvenir shops abound. Our final stop, a 5-star Sheraton Resort Hotel that rivals any hotel I have ever stayed in anywhere. How they ever assembled the material to build this hotel in this remote area – in the middle of nowhere – is a mystery to me. To end the day, we took a short ride to a local restaurant – The Tibetan dishes included: Beef in black bean sauce, Beef in black bean sauce, Pork in sweet/sour sauce, Yak – Tibetan style (is there any other way to eat yak? ), Beef and peppers, Free range chicken, Mushrooms and preserved duck eggs (not my favorite), and Dry stir fried green string beans – very tasty. The Wifi is good here so I will stop to post some pictures. Day 7 – Jiuzhaigou Valley National Park – Sunday, June 8 I am not going to waste time with words trying to describe this park – a “crown jewel” of China’s National Park System. Short of magnificent, astounding, beautiful, etc., I do not know the words. This park attracts 3,000,000 visitors each year and rivals Denali, Yellowstone, and Yosemite National Parks. Go directly to the pictures at: https://www.flickr.com/photos/sehastings1/collections/ FYI, there are versions of all this pictures we me standing in front of the waterfall, lake, mountain, etc. Let me know if you want a copy. Enjoy – Steve Day 9 – Huanglong (Yellow Dragon) National Park – Monday, June 9 After a 2 hour bus ride through the beautiful Sichuan country side we stopped briefly for pictures at 13,000+ feet. We then descended to 10,000 feet to the entrance to the park – another of the premier parks in China. We saw perhaps 10,000 to 15,000 visitors and we were the only Westerners there! This park and the previous one are in very remote areas! The day before we were stopped by a Chinese woman who at 64 years old who had never seen a non-Chinese person – lots of pictures were taken. This park was as magnificent as the last, but you had to work for it! The “climb to the top”, one of Xiang’s favorite spots, was 3 miles UP 2,000 feet – it seemed about a million steps. Three of us persevered and made it to the top! The Buddhist Temple and spectacular pools made it worthwhile – after I caught my breath! Then, a late flight back to Chengdu – this am we slept in for the first time on the trip! 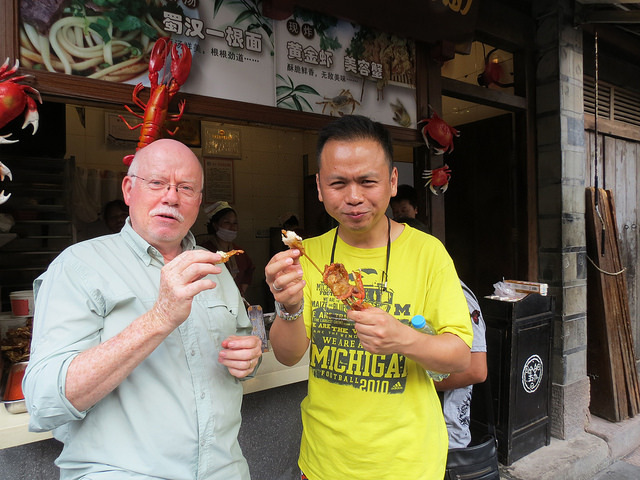 Day 10 – Chengdu – Tuesday, June 10 We slept in this morning and convened for lunch at 11:30 am. We traveled by bus to the “Wide and Narrow Street” district for lunch and shopping. Lunch was typical “small pot” food with some large plates of food thrown in for good measure. The best were twice cooked pork, shredded pork in steamed bun, noodles in a spicy sauce (surprise! ), and pot stickers (the best that Xiang has ever had!). After some shopping, we traveled to a Tea House for tea and snacks and some down time. Xiang provided a short history lesson of China – very interesting. Then, a brief Tea Ceremony – a short 3-act play. After the play, we hurried to the airport to catch our flight to Guilin only to find our flight delayed. We arrived at the hotel in Guilin at mid-night – right to bed! Day 11 – Guilin to Yangshou – Wed, June 11 “Up and at ‘em” by 8:00 am, we took the bus to the wharf to take a 3 hour cruise down the Li River. This part of the river has some on the most spectacular natural landscape in China. 300 million years ago this whole area was under water – an ocean floor. The cruise included lunch, of course. The highlight was deep-fried baby shrimp – you eat the whole thing. The cake for dessert was pretty tasty as well. We docked in Yangshou, up river, to stay for the night. After checking in to one more luxurious hotel – the best in the city! After a rest – 20 minutes – we took the bus to two famous sites near the city. The Banyan Tree is reported to be over 1400 years old and became a tourist destination after it was used in a scene of a famous Chinese movie years ago. On the ride we passed another highlight, the Moon Hill – the hole in the mountain looks like the moon! Returning to the hotel we had another brief rest – 15 minutes – we were off again to visit West Street – the Walmart of Chinese goods for tourists. Bargaining is a way of life at these shops – they ask 200 yuan and you offer 50 yuan, and on and on until the deal is done. You usually have to “walk away” at least once, but you will usually get lured back. At one point, I was outnumbered 3 to 1 by sales ladies. I am not really sure how much I paid, but they got all the money I had on me! Dinner featured the regional specialty, Beer Fish; a whole fish cut into pieces and served with tomatoes in a delicious sauce. Also on the table were roasted chicken, mushrooms and pork, pumpkin stems and sweet balls of dough with taro inside for dessert. After dinner we went to, according to Xiang, the most fantastic outdoor performance in the world – Sister Liu’s Impression. This show involves more than 700 performers telling a famous Chinese story of Sister Liu and conveying several important cultural attributes of the local minority people. Remember, China has 55 minorities – all with their own history and traditions. More that 2000 people were in attendance! They do the performance every day, weather permitting. 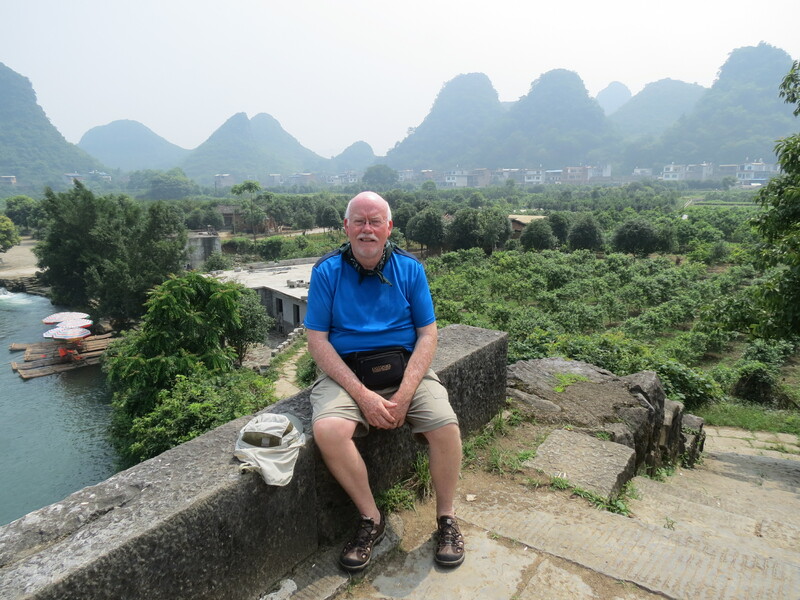 Day 12 – Yangshou to Guilin– Wed, June 12 Today, another exciting adventure. For centuries, the local people have traveled on the Li River on bamboo rafts. After a short drive into the exotic Yangshou country-side, we experienced the tourist’s version of this ancient mode of travel. We carefully boarded rafts and put on the mandatory life jackets; then, we shoved off on a delightful, peaceful trip up the river (actually, a tributary of the Li River). Our helmsmen not only provided the power with long bamboo poles, but also skillfully negotiated the rocks, and twists and turns in the river. Our destination was a beautiful 600 year-old foot-bridge that arched gracefully across the river. One can only imagine the many steps taken across this bridge in the last six centuries! (the picture I posted of this bridge in one of my best, I think) The return trip, floating with the current, was much easier on the “captain”. Back on land, safely, a “nutty-buddy like” ice cream cone provided a nice treat before we boarded the bus for the drive to Guilin. Lunch-time found us in the restaurant district of Guilin. The travel agent had reserved us a room in a restaurant called “The Left Bank” – across the street was an “Irish Pub”. This restaurant was one of the few not chosen by Professor Gao. The many dishes were very good, but he promised us better for dinner. After lunch and a few minutes of “street shopping”, we took a short ride to one of the more popular attractions in this area – The Reed Flute Cave. Used by tribes for centuries as a hiding place, this enormous cavern was open to the public in the 1980’s after the addition of secure walkways, colored lights and music. Dinner followed a short rest at the hotel. The restaurant was the biggest and busiest I have seen in China. It was filled with tables of students – perhaps, 500 – 1000 – celebrating the end of school (we think). Dishes included several local specialties – Steamed-fish, roast goose, shredded goose, and barbequed goose wings, spicy green beans, creamy corn soup and black tofu. All were delicious; however, I did not try the black tofu – even I have my limits! Tomorrow, we catch an 11:00 am flight back to Bejing – where we started 2 weeks ago. Day 13 – Beijing – June 13 Today was largely a travel day – after our flight, we arrived at out hotel about 3:30 PM. After checking in, we assembled for the last activity of the trip – a performance at the National Center for the Performing Arts (aka, the “Egg”). In route, our bus traveled the widest street in Beijing – 6 lanes in each direction. Of course, Xiang insisted on “one last” group photo before we entered. Built for the 2008 Olympics, Xiang considers the NCPA the premier performing arts center in the world – he has played here twice. It contains several concert halls and opera houses. The performance we saw featured music from several notable Chinese musicians. Tiananmen Square and the Forbidden City, reminders of China’s history are nearby. Next, our farewell dinner! This was perhaps the grandest meal of all – sweet lotus root; sweet and sour chicken, cold duck, twice cooked pork bellies, chicken and peppers (many more peppers than chicken – nick named “find the chicken”), egg plant and walnut biscuits for dessert. Rice liquor was served to cleanse out palates between dishes. Xiang introduced us to the ancient Chinese toast of “Empty Your Glass”. Day 14 – Beijing to JFK – June 14 And so, the adventure ends as we return to Beijing airport one last time. We leave on Saturday, fly 13 hours, and arrive on Saturday – a pretty neat trick. Luckily, the flight is not crowded so we have room to spread out. After 8 flights, 5 cities, many miles traveled, and a few places not on any map, it is difficult to summarize the history, the cultures, the people, the customs, the natural wonders, and the food, that we have experienced over the last two weeks. China is an amazing place, to say the least, rich in people, diversity, and natural resources. Most remarkably to me – it is a country of contrast; great wealth and affluence co-exist with poverty and subsistence existence. As a country, it faces many challenges in the future. Please forgive any errors or typos as most of this was typed late at night or “on the go”.